Kediri as one of East Java regency has known by many people and tourists, because it has many interesting tourism objects. Kediri is interesting regency that able to invite both domestics and foreign tourists to visit its beautiful tourism objects. This area is surrounded by mountain and has a lot of nature scenery, so that it makes its air cold and fresh. 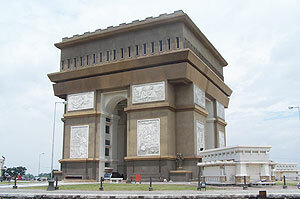 This regency also save historical value and common said has the old kingdom in Java Island. The nature lovers are common visit this regency, because Kediri has the famous mount that is Mount Kelud. This is volcano mount, but its charming scenery has attracts the tourists to visit this mount. It has the channel to the crater, sulfuric lake, cool plantation, etc. Beside Mount Kelud, the other Kediri’s nature scenery is Irrenggolo and Dolo Waterfall that also give the pine forest scenery. There are also the historical tourism objects such as; Surowono Temple, Tegowangi Temple, and the famous Sri Aji Joyoboyo Graveyard. Those are the original building of Kediri culture since years ago. The other interesting places in Kediri are Ubalan Park and Bendungan Gerak (move dam). The government of Kediri regency always tries to develop Kediri tourism in order to known by a lot of people and add the income. Kediri has improved its tourism facilities to make the tourists as comfortable as well. Welcome to Kediri Tourism, we hope that the tourists can enjoy the beautiful of tourism objects, traditional art, and historic tourism objects.